I know that this post is going to be random, but it's just a little teeny insight into one of the things that makes me VERY VERY happy... yummy food! And the last day I have been extremely happy as the photos on the left show :) Last night, awesome grilled burger and a Diet Coke (my 2nd of the day - eeek!) 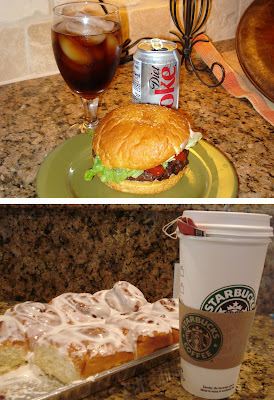 and then this morning cinnamon rolls and Starbucks - I'm sorry, but it doesn't get any better than that. Tonight I'm making poppyseed chicken so the good times should just keep on rollin'. ha!